Now, we get handed plenty of business cards here at MR, but this is pretty much the greatest we've ever seen - and it comes from guru of all things heavy, Kurt Ballou. The producer and Converge guitarist's current card doubles up as a PCB, you see. Solder it up, add $40-$50 worth of parts, and you'll have yourself a distortion pedal. Ballou says the design is called the Brutalist Jr, and when it's released in 2017 under the GCI name, it should look a little like the prototype below. 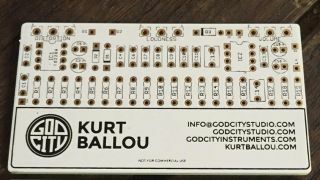 Until then, you'll have to first bump into Kurt Ballou (possibly by hanging around his Massachusetts-based GodCity Studio), then get busy with the soldering iron. Good luck!